WASHi is Actively involved in action research project to evolve low cost, environmental and user-friendly Sanitation, Faecal Sludge and Septage Management related products/solutions. 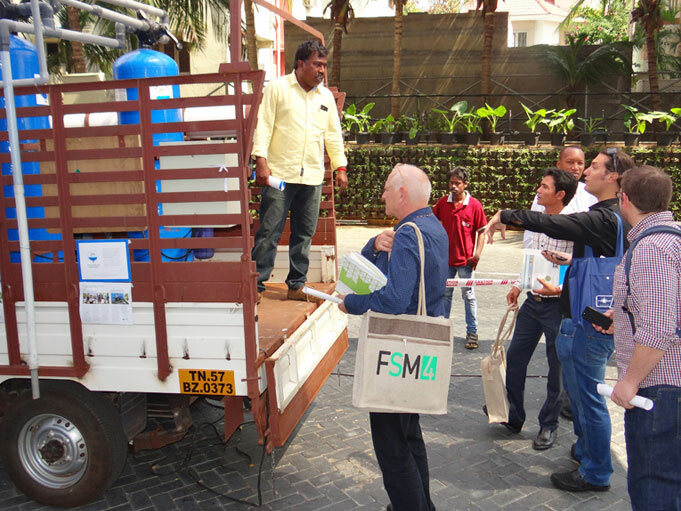 Also, conducted many studies on sanitation, FSSM and water supply themes. WASH Institute is also the convener of National Faecal Sludge and Septage Management Alliance (NFSSM Alliance) that does policy advocacy on Faecal Sludge and Septage Management (FSSM) with MoUD, MDWS and States. The on-site mobile treatment unit works with the concept of solid-liquid separation, sludge thickening and effluent treatment process. While the liquid is separated from the solid, the effluent passes through the membrane treatment process and disposes the treated water. The treated water meets the established pollution control norms for wastewater disposal. Both BOD and coliform values are within the Pollution Control board norms.The sludge thickening process helps further in reducing the moisture content in the sludge. The total cost of each mobile treatment unit is much lower than the septage emptying trucks used by the private operators. This mobile unit is easy to operate and it's operational & maintenance cost is also at lower side. In general, the septage consists of higher percentage of liquid than solid and most of the truck operators have to carry the entire septage (solid & liquid). This puts extra burden on transportation and treatment facilities. The mobile treatment unit helps to get rid of the extra load (effluent) at the source and creates an opportunity to transport more sludge load (solid) in less trips. This will bring down the truck operational cost especially fuel cost and maximize the profit. If the truck operators pass on this benefit to the customers, then the customers will have to pay less for desludging services. Secondly, the treatment facilities will also benefit due to less load. The 'Pit and Septic Tank Life extender'is compact septage treatment unit is meant for treatment of liquid effluent of household septic tanks and leach pits, on daily basis. The liquid from the pit or tank is lifted using a small submersible pump through a primary filter arrangement in order to check the solid materials within the pit and send only the effluent through the membrane filter system to dispose the treated water. The treatment capacity is 25 litres/hour. As the sludge usually contains high percentage of effluent, using this product will extend the emptying period of pit/tank considerably.This product also helps to check the environmental pollution by discharging the treated effluent in open.